The proportion/balance of the element will be very different. I want the new composition to have a vertical orientation. It will also have a definite front, back and sides as opposed to the old one which was low and circular. For these reasons I’m using a 60mm resin cube to sit the diorama onto. My first task was to sort out the monoliths. 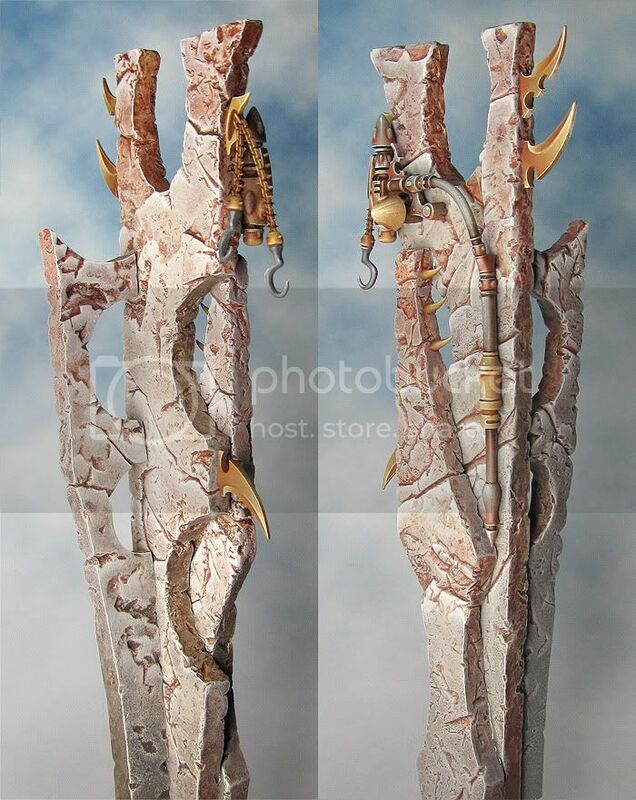 I’d sculpted these out of Super Scullpey Firm so fixing the warped monolith was a simple matter. I heated it up with a hair dryer (not my own, alas I have no need) and allowed it to cool while held flat under a weight. To prevent the problem happening all over again I needed to find something to fix onto the big monolith as a reinforcement/brace. It took me a while to realise that the best solution was to use the two smaller monoliths to reinforce the large one. I’ve now pined and glued the three monoliths together into a single structure and I’m really pleased with the result! This new single monolith will be the main element of the diorama base and will provide support for a couple of the ‘flying’ models. Dark Elf Diorama – rethinking the design! 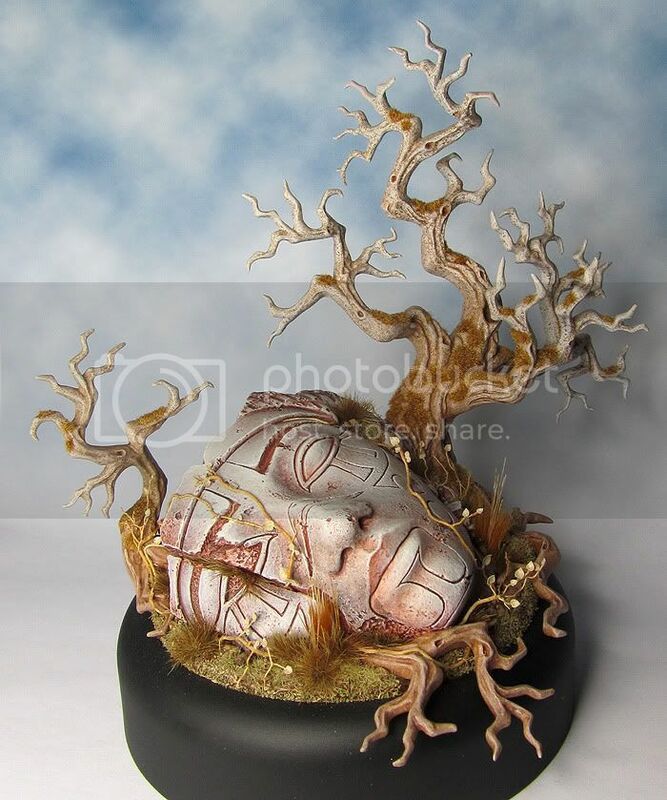 For some time I’ve had a nagging feeling that something isn’t quite right with the base for my Dark Elf diorama. Coming back from my summer holiday and looking at it with fresh eyes I became certain that I needed to have a rethink. This isn’t all that unusual for me to be honest as I employ a special technique called ‘making it up as I go along’ this means that although I start out with a plan I often change things as I develop my ideas. But this time I decided on a total reworking of the base. There are several things that I wanted to address. The overall size of the base/diorama is too big. I want a much smaller/tighter composition. The largest of the monolith I’d sculpted has started to warp and developed a silly looking bend. I’ve put a lot of work into the base and wanted to salvage as much as possible but at the same time it’s no use persevering with a design if it isn’t working for you. It was time for a little brute force and a lot of nerve! I removed the monoliths from the base. That sounds nice and easy doesn’t it? The process involved a lot of pulling, wiggling (the model not me) and even a bit of snapping! After all that and some fairly harsh language the monoliths were liberated from the base with minimal damage to either. Next I removed all the Dark Elf skulls and totems, which was a fairly easy matter as I have only fixed these lightweight pieces into place with PVA glue. The Old base is now stripped of all the dark Eldar elements and I have to say I prefer it that way. With just a little repair work I think I will have a rather nice forest/ruins themed base for a fantasy subject but that will be a job for another day. It’s time to start work on the new Dark Elf Diorama base ... more about that very soon. Hellion - work in progress. Oh well, the best laid plans and all that! July turned out to be a bad month for painting as there have been a lot more important things going on in my life that just had to come first. That's the way it goes sometimes. Having said that I've always been the sort of painter who like to put his work aside from time to time to consider the next move. It’s a luxury I particularly enjoy because my professional output is completely deadline driven. It is however time for another post so here is a little something to keep the ball rolling. It's the second Hellion for the Dark Eldar diorama...or at least the start of the second hellion. Very much looking forward to going off on my summer holls and coming back rested and ready to paint!